IWB carry has quickly become a mainstay here in the United States. 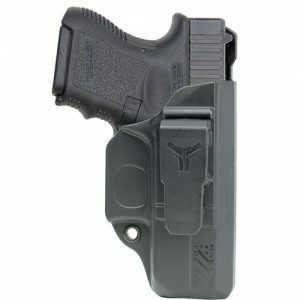 A good IWB holster married to the fantastic Glock 26 can make a fantastic conceal carry piece. 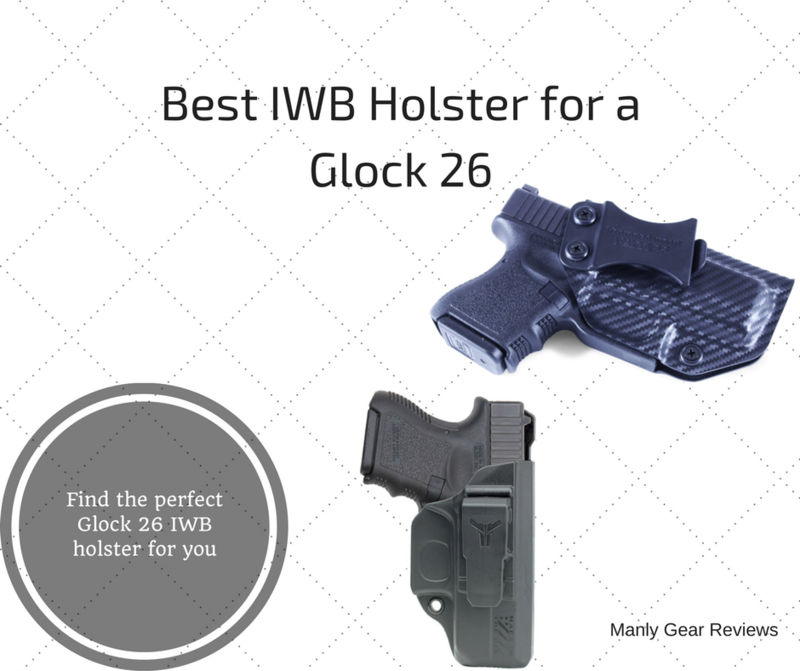 Read more to find out what is the best IWB holster for the Glock 26. Find out why the FoxX Waistband Hybrid Holster won our Editor’s Choice as well as where the four other excellent Glock 26 IWB holster options stack up. A Glock 26 is a truly potent pistol that’s favored for personal protection. It’s reliable and powerful, which is why so many people have come to rely on the pistol on a daily basis. In order to make the most of this gun it’s important that it’s matched with a solid holster that’s going to keep it readily available, especially if you’re planning on using it for concealed carry like I am. Now I spent quite some time searching for a quality Glock holster, and they aren’t that easy to come by. Many holster just aren’t comfortable, or they’re difficult to conceal properly even though the manufacturer says otherwise. I spent years comparing different holsters, and I’m going to share my findings with you and everyone else interested in a new holster. Now I’m not saying that I personally own each of the IWB (inside the waistband) Glock holsters on this list, I’ve had experience with all 5 of them. I personally own a few, and I have two other buddies that each have Glocks and between them they own the other three holsters. So I can honestly say that each of the holsters down below has a legitimate reason for making this list. Versatility: Everyone is shaped a bit differently. For a holster to work well for most people it has to be adjustable. You should be able to change the angle and the location of the holster enough to make it comfortable and fully functional. Comfort: Holsters are worn all throughout the day by many people. They must be comfortable or they’ll quickly become a nuisance to wear around. Ease of Draw: In a serious situation one of the most important factors of any holster is whether they allow you to draw smoothly and quickly or not. It’s important that the holster gives the wearer complete access to their firearm, and that it’s available right when it’s needed. 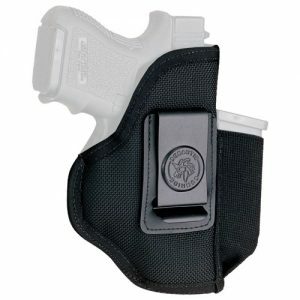 Security: Holsters are tasked with the important task of keeping your firearm locked in place. They can’t fail at this task under any circumstances. That’s exactly why it’s so important to track down a holster that locks firearms firmly in place reliabily. The FoxX waistband holster is a pretty decent solution for keeping your gun right where you want it. It effectively locks onto a belt or the waistband of my pants, and it’s extremely comfortable at the same time. The holster felt a little unnatural at first, but after a couple days of wearing it around it began to form to my body really nicely and became even more comfortable overall. The holster is designed for use with a Glock 26, 27 or 33, and it’s designed to hold each one snugly. When in use the holster keeps guns from sliding around, but it makes them readily available as well, allowing a nice smooth draw when necessary. It feels very solid and I expect to get a couple years of use out of this affordable holster at least. This IWB holster from Blade-Tech is a really well-designed piece of equipment that’s ideal for carrying around a Glock 26. Not only does it fit the gun like a glove and hold it securely in place, but it’s supremely compact as well. The holster makes it very easy to keep your firearm concealed in most standard situations, which is exactly what most gun owners are looking for. The best feature of this holster is the locking mechanism it has in place. When you push your firearm down into it you’ll hear an audible “click” that signifies it’s locked in place. Once locked the gun is nearly impossible to pull out without being unlocked, and doing so is easy as well. Simply put a bit of pressure on the side of the holster and the locking mechanism unlocks enabling the gun to slide out effortlessly. The clip is a bit big, and will work better for taller users than short ones, but it’s an excellent lightweight carry tool for most people. 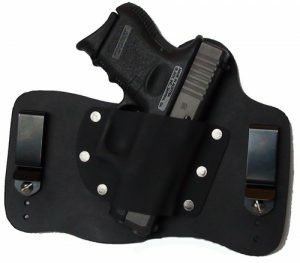 This Galco holster is one of the more comfortable options tested out on this list. That’s because it’s made from exceptionally smooth leather. It’s designed to fit a Glock 26, 27 and 33 and holds each one snugly in place thanks to the metal snap at the top. The holster fits a range of belts and will sit comfortably out of sight when in use. It’s a bit more cumbersome to draw from at first, but after you get used to the thumb flick motion needed to unhook the gun it’s simple to pull your glock out in one smooth motion. The holster is functional with most bottoms and is comfortable even when another shirt isn’t worn underneath it for padding. When you’re looking for a really low carry holster that’s easy to conceal, this Desantis model is a good option. It sits very low on the hip and doesn’t poke up much past your waistline at all. That means you’ll be able to keep your gun out of sight during use, and you won’t have to worry about walking carefully to avoid having your gun come into view. There are a few major positives with this holster. It’s designed to lock securely on most pants or belt loops and there isn’t much shaking or movement while walking, running or even jumping. It’s made from relatively durable black nylon that’s a bit less work to maintain than leather holsters are. Overall it’s a solid holster and it comes with a convenient storage pocket for an extra magazine of ammo if you really want to be prepared. This compact holster is just the thing to keep your glock securely in position all throughout the day. It’s durable and sits nice and low when worn. 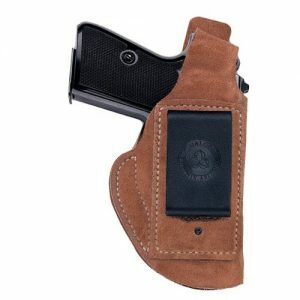 The holster is comfortable and highly adjustable so you can achieve a perfect draw. It comes with a nice strong clip that will prevent movement throughout the day. This Kydex holster doesn’t just do a good job holding your gun, it looks nice as well and will add to the aesthetic of your gun if that sort of thing matters to you. 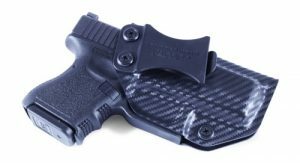 The holster is covered with a stylish carbon fiber pattern, and it’s something that you’ll enjoy showing off to other gun enthusiasts.